Using your credit or debit card to make a deposit into your Superpoker account is fast, easy and secure. - Visa, Mastercard, Diners Club International, Visa Electron, Maestro and Solo are currently supported. - On your first deposit with your credit/debit card you will have to register it, which will allow you to make quick deposits later on. - There are never any fees for this service. 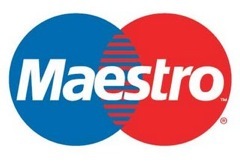 - Maestro allows players to fund their Superpoker account via debit card in the UK, Austria and Spain. - Solo allows players to fund their Superpoker account via debit card in the UK. - This method does not provide withdrawal services.